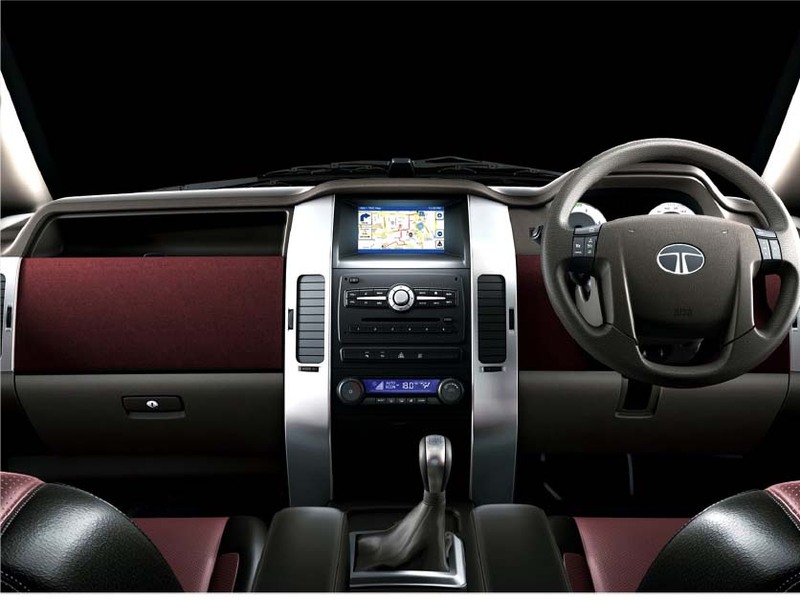 Tata Motors has always been in the business of providing more facilities in its vehicles at affordable prices. From Tata Sierra, Estate in the 90s, Indica in the 2000s and the latest Nano were all reflections of this philosophy of Tata Motors. Tata Indica was an affordable diesel car introduced to replace the Ambassador every Indian drove and at prices less than the big elephant. Tata Motors got global attention when they introduced the world’s cheapest car –the nano. 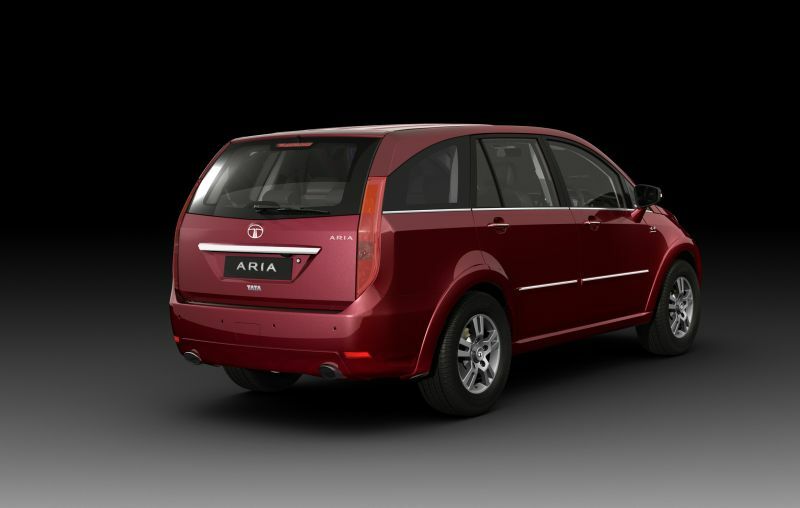 The latest car introduced by Tata is Tata Aria.Everyone refer to it as a crossover. I don’t know what exactly a crossover is. But looking from it’s shape I feel that crossover is a car containing features of an SUV and a normal sedan. The front would be looking like a sedan while the rear will look like an SUV.In India people call Tata Sumo, Mahindra Xylo, Toyota Innova, Chevrolet Tavera etc as SUVs but they are really MUVs or people movers. Front view of Aria looks like a sedan. The slanted bonnet and grills are similar to that of an Indigo Manza.The front headlight design is novel and it has sensors to recognize the intensity of light outdoors and glow on it’s own. You can light it up even with a button on the remote key. This would be helpful if you park the car in a dark area and you got to walk to there. The windscreen wipers are automatic, designed to sense rain and work on it’s own.The bulging wheel archs and 17 inches alloy wheels of Aria can be attributed to it’s SUV character.The back side really look like an SUV.Twin chrome exchaust pipes add macho character to Aria. Interiors are good quality. Dashboard plastic is better than that of Japanese cars. The driver information console in the instrument cluster shows fuel efficiency, odo/ trip readings and temperature.The system gives occasional notifications to the driver.When the wind screen wiper fluid is empty, a message pops out for the driver. The seats , gear knob and steering wheel are finished in leather.A GPS navigation display is kept in the middle portion of the dashboard. Route information of 400 indian cities is present in the navigation system. There are two cd drives on the bottom of the 6.5 inch TFT LCD Screen. Top drive is for the cd of gps navigation system and bottom is for the in car entertainment system where you put your music cds. Steering has got switches like audio control, cruise control and call control. Using Bluetooth connectivity you can connect about five mobile phones to the car. You can attend call by pressing a switch on the steering ,then the volume goes down and you caller sound will be heard on the speakers of your in car entertainment system. In Car Entertainment system has usb connectivity for playing USB flash drive and six speakers for providing 3D surround sound inside.The GPS display functions as a reverse parking camera when Aria is in reverse gear. The only disadvantage is that the audio system does not come with a remote control. There is enough storage space in the roof of Aria. About 6 compartments in the glove box is enough to keep documents of car, Cds, maps , sunglasses etc is a good part. The glove box on top is divided in to two parts and one part can cool your soft drinks and food stuffs. Tata Aria is a 7 pax car with seats arranged in three rows. When you fold the seats of rear two rows, you get a flat storage space to carry your bike or other luggage. The third row seat are designed for children. Adults would find legroom small sitting in that seats. Second layer can be easily folder and access for the two children to the third row is not a problem. The driving seat’s height, steering position, rear view mirrors, power windows etc can be manually adjusted. The dual zone automatic a/c is great in area and the vents in B pillar make sure that people in backseats also feel comfortable. The sheet metal body is very hard and the car has secured 4 stars in European crash ratings. 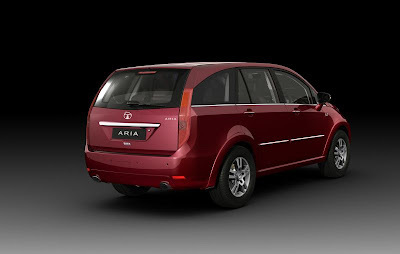 Six airbags, Disc brakes on four wheels with ABS and Electronic Stability Program are the security features of ARIA. ARIA has 20cm ground clearance making it ok for offroading. 2.2 Litre Diesel engine used in Tata Safari and Tata Sumo Grande is the heart of Tata Aria with minor refinements. The engine offers 138 bhp power and maximum torque of 320 Nm. All wheel driving system makes it very stable when offroading. You can switch off All wheel drive from the dashboard when you are back at a highway . When switched off the engine power is fed to the rear wheels only and the car then moves on rear wheel drive resulting in good mileage. The heavy car is powerful to drive and gearshift quality is ok. Turning radius of 5.6 m is ok for a car of this length. You can walk in and enter ARIA so no difficulty for your grandmother to get in to ARIA due to the vehicle height. There is no one in the market you can compare ARIA with. You can get features not in Toyota Fortuner and Hyundai Captiva at a price very much less than that of Ford Envdeavor. Pleasure – Rs 12.95 Lakhs. Dual Tone Interiors available in Black – Biege, Black – Plum and Black – Black combinations. ARIA is available in sardinia red, nightshade black, quartz black, walnut gold, pearl white, artic silver, castle grey and surf blue colors. Price Between 13 and 16 lakhs Indian rupees.